The Recipe for Empowerment launch event on September 22 gave supporters an opportunity to witness the impact of Vicente Ferrer Foundation programs, try flavors from around the world, and celebrate this major milestone in VFF’s history. 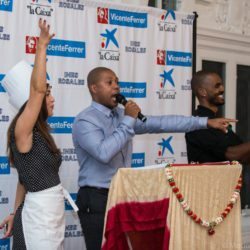 Celebrities, philanthropists, social change makers, and dignitaries gathered at the Former Residence of the Ambassadors of Spain for a beautiful evening. In July, CGC started working with the Will & Jada Smith Family Foundation on marketing for their Careers in Entertainment Initiative and on September 21 the first stop on the CIE Tour kicked off at the Brooklyn Expo Center with over 500 students, administrators, exhibitors, and panelists in attendance, including special guests Jada Pinkett Smith, Jussie Smollett, Leona Lewis, Regina Hall, and many more.